Dissolve yeast in lukewarm water. Stir in milk and 1/2 cup of flour. Leave in a warm place for about 15 minutes. Gradually add other ingredients. Knead the dough well until elastic and smooth. Let it rest (while preparing the fillings). On lightly floured surface, roll out dough 0.2 inch thick. Cut out circles about 5 inches (=12 cm) in diameter. Put 1 tbsp of filling on each dough circle. Fold the ends to form Vatrushki so that the filling in the middle can still be seen. Line baking sheet with parchment baking paper and sprinkle with water. Place ready Vatrushki on the baking sheet and let rest for about 10-15 Minutes. Pierce some holes in the middle of Vatrushki with a folk. Mix egg yolk with butter and brush Vatrushki. Preheat oven to 180-200°C (350-390F). Bake Vatrushki for about 15-25 minutes (depending on how big they are). Make sure Vatrushki don’t get too brown on the top. The bottom should be well done. Take Vatrushki out of the oven, place on a wooden cutting board, cover with a dish towel and let rest for about 10-15 minutes. Cream all ingredients together. Put a tablespoon of the filling in the middle of each dough circle and form Vatrushki. Vatrushki are usually made with cheese (curd) filling. Grate apples; combine with sugar and water and sauté shortly. 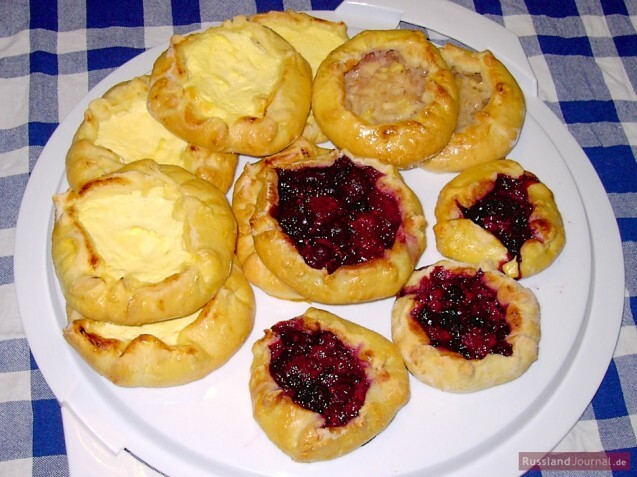 Brush dough circles with jam. Let apples drip off well before spreading the mixture on dough circles. Sweeten berries to taste with sugar and spread the mixture on dough circles. Cranberries are quite popular in Russia. But you can also use other berries.